← Flying out of Domodedovo – not your average airport! On my visit to Saint Petersburg a visit to the local railway museum was on my itinerary, but the city doesn’t make it easy – there are three separate museums, each catering to a different facet of Russia’s railways. So how do you tell them apart? Regarded as the best railway museum in Russia, the Central Railway Museum is located in central Saint Petersburg on Sadovaya Ulitsa, and charts the development of railways in Russia and the former USSR from their inception until today. To see actual trains and not just displays, a visit to the Oktyabrskaya Railway Museum is required. 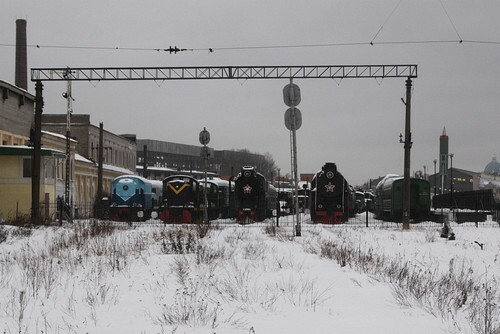 Located at the former Warsaw Station (Varshavskiy Vokzal), the open air museum has rows of trains on display, ranging from steam and diesel locomotives, to a giant TM-3-12 railway gun, and a RT-23 Molodets rail-based ICBM system. Covering the history of Saint Peterburg’s tramway system, the Museum of Urban Electrical Transport on Vasilyevsky Island features restored tramcars, as well as historical displays. This entry was posted in Tourism, Trains, Trams and tagged railfan guides, railways, Russia, Russian Railways, Saint Petersburg. Bookmark the permalink.